Ginseng has been a popular herb since ancient times, and its list of medical uses is constantly being extended due to new research. Discover its history and many benefits. Ginseng is one of the most revered herbs in the world of natural remedies and has a long history of use in Traditional Chinese Medicine. The extraordinary claims about the healing powers of the ginseng plant have raised the curiosity of the scientific community, and numerous studies have validated some of its main benefits. Replenishing energy. Ginseng has long been prescribed as an energy provider. It is used as a revitalizer and has been favored by athletes looking to enhance their performance. Relieving stress and anxiety. Ginseng has an effect on the hormones that help people to deal with stress. Reducing inflammation. The active compounds in ginseng have been shown to inhibit internal and external inflammation. Supporting the immune system. Antimicrobial compounds exist in ginseng which can help to fend off bacterial or viral infections. There is a vast array of claims about other conditions that can be treated with ginseng, including withdrawal from cocaine, side effects of radiation therapy, depression, erectile dysfunction, and hangovers. However, further studies are required in order to validate these potential applications. All types of ginseng contain compounds that are believed to support and enhance the hormonal response to stress. It is though that saponin glycosides, or ginsenosides in the Panax genus are responsible for ginseng benefits. 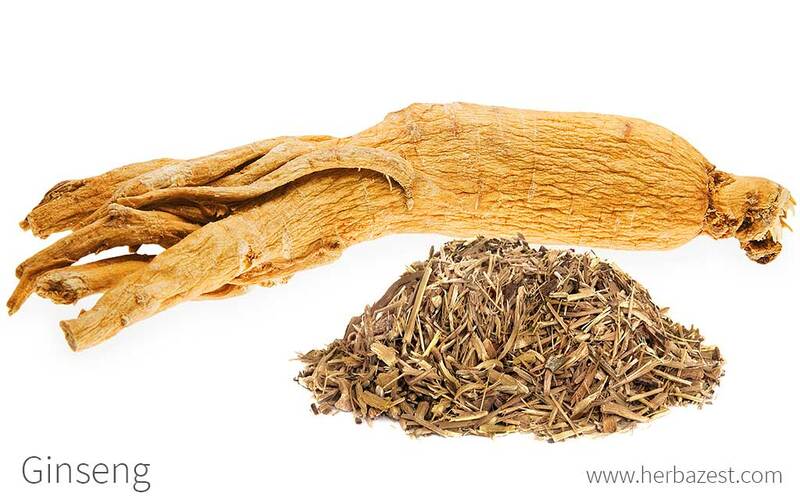 Researchers have identified further pharmacological components that can be found within this Asian root and are behind most of gingeng benefits. These include polyacetylenes, polyphenols,and acidic polysaccharides. Polysaccharides are used by the body as a “back-up” energy source, which explains the use of ginseng as an energy provider, whereas polyacetylenes are toxic to fungi and bacteria, also supporting immunity, and fending off infections. They also act as an anti-inflammatory. Additionally, polyphenols are powerful antioxidants, and can protect the body from free radicals that cause cellular damage, as well as helping the body to sustain an efficient immune system. Other herbs with estrogenic properties are dong quai and soy, while coffee and guarana are also stimulant. Although ginseng is generally considered safe for consumption, it may have some undesired side effects in some people. Reported symptoms have been headaches, problems sleeping, and digestive complaints. Women who are pregnant or breast feeding, as well as anyone who is on medication for a serious condition, should seek medical advice before start taking any ginseng supplement. While medicinal forms are best to fully take advantage of ginseng benefits, if consumed in high doses, the Asian root may alter blood pressure and blood sugar levels. Those who suffer from diabetes or high/low blood pressure should be wary of consuming ginseng, and seek advice from their physician before doing so. In sensitive individuals, ginseng may also cause allergic reactions such as generalized rash, low blood pressure, and shortness of breath. The most popular way of consuming ginseng is probably as an infusion. However, there are many other methods to make the best of ginseng properties, each recommended to users depending on their conditions, lifestyle, and preferred mode of intake. In many Asian countries ginseng roots is popularly used as a culinary ingredient. Ginseng is traditionally eaten raw in China, so many of their recipes call for the fresh rather than dried plant. It is mostly found in recipes for soup, casseroles, and sauce-based dishes. Infusion. It is very common to brew the dried ginseng root for oral consumption. Many people enjoy the taste but honey and lemon can be added to the infusion if preferred. Powder. A great way to reap ginseng properties is to add the dried and finely ground Asian root into yogurts, juice and smoothies. This method is favored by gym-goers who wish to complement their exercise regime with an energy-boosting drink. A recent trend consist if brewing ginseng with coffee to make a energizing beverage. Tincture. This is a popular option for those who wish to store a concentrated form of ginseng for medicinal purposes. The alcohol content of the mixture preserves ginseng properties and prolongs its shelf life. Capsules. Usually made from the powdered ginseng root, capsules are ideal for ensuring a consistent concentration is consumed. They are a fast method of intake. Essential oil. Generally designed for topical use, the ginseng essential oil can be effective in soothing inflammation on the skin. It can also relieve stress when vaporized in an oil burner. Lotion. This is a preparation designed to sooth inflammations and rejuvenate skin. It is specifically marketed towards mature men and women. Commercially-grown ginseng root can be found at many grocery stores and supermarkets, either as the full root or, more commonly, in powder form. Red and white versions are the most widely available around the world; wild and wood-grown varieties remain harder to find, especially in Western countries. Harvesting tends to take place in the autumn months, so seasonal farmers' markets are also a good resource, as well as specialized health stores. Ginseng supplements are increasingly common, and they can be found in most locations that cater to herbal medicine, as well as some that are more general. Specialized health stores and even wholesale retailers widely carry the product in a variety of different preparations. Online retailers also provide an easy way to compare prices and brands to fit personal needs. Ginseng is a slow growing perennial herb that takes approximately four years to mature. After planting, ginseng requires minimal attention other than checking for pests and diseases every so often. When harvesting, it is important to take care to keep all the forking branches intact. Awareness of the following advice is helpful when attempting to cultivate ginseng. In order to grow healthy, the ginseng plant requires a rich soil, constantly moist and well-drained, with an ideal pH level of 5.0 - 6.5. Ginseng prefers shaded to partial shaded locations, and an average temperature of 50°F (10°C). If growing ginseng from seeds, these will need a to undergo a process of stratification, which requires moist and an low temperatures. Ginseng seeds or roots should be planted around 14 - 18 inches (35 - 45 cm) apart. The ginseng plant is rarely affected by pests; however, it can be attacked by slugs. More detailed information about growing ginseng can be found in the herb garden section. Ginseng is a slow-growing shrub, which rarely exceeds a height of 20 inches (50 cm). Its name is an English adaptation of the Chinese term rénshēn, which combines the characters for "man" and "plant root" to describe the shape of the root, which is the most valued portion of the plant. The stem separates into a number of thinner shoots, from which grow clusters of medium sized oval leaves. An additional thin shoot will develop flowers at the end, which are around 0.07 - 0.11 inches (2 - 3 mm) in diameter. These will also develop fruits which look similar to cranberries. Ginseng belongs to the Panax genus and is a member of the Araliaceae, or ivy family, which contains 18 accepted genera and around 1400 species. Asian and Wild ginseng are not to be confused with Siberian ginseng (Eleutherococcus senticosus), which belongs to another genus and offers completely different benefits. There are two main species or types of ginseng in the Panax genus with great medicinal and economic importance: Asian ginseng (P. ginseng) - which is native to China and other areas of East Asia - and Wild ginseng (P. quinquefolius), originating from North America. Both species share similar benefits; however, they have different specific uses. There is a general confusion about ginseng since the same root is sold under different names (Asian ginseng, Korean ginseng, red ginseng, white ginseng, and black ginseng). This is due to the different processes the Panax rhizomes undergo, which result in different concentrations of active components and a variety of applications. The ginseng plant has an interesting, somewhat political, history. Despite the fact that the oldest known species of ginseng (Panax ginseng) is native to China, the country was unable to cultivate enough of the plant to satisfy the needs of the consumers. For this reason, China imported ginseng from Korea since before the 18th century. In 1709, a French Jesuit named Pierre Jartoux traveled to China, and there he discovered the ginseng plant and learned about its many uses. Believing that North America had a similar climate and terrain, he expected that it might be possible for the same species to exist there. He sent a letter to inform the Jesuit community in North America, and it was soon discovered that he was correct. A similar species of ginseng (Panax quinquefolius) was identified and found in abundance across the country. After this realization, Americans began exporting the plant across the world at a cheaper price than Korea. China therefore switched suppliers, thus damaging Korea-North American relations. The inexperience of the Americans in cultivating ginseng led to their being unable to keep up with demand, and in the mid-19th century it was necessary to employ some Korean traders to come to North America and teach effective cultivation and production methods. The Greek word Panax is translated as "all-heal", referring to the multiple uses of ginseng. Worldwide cultivation of ginseng has proven so effective that the root's market price has dropped drastically in recent years - almost as low as the actual cost of production. Nevertheless, the industry continues to find ways to thrive, generating an estimated 354 million tons of ginseng in 2010, most notably from China, Canada, and the U.S. Woods-grown and wild-stimulated versions are surpassing classical agricultural methods in creating revenue as organic movements influence economic trends. Some people consider older roots advantageous and will pay exorbitant amounts: in 1976, a 400-year old root reportedly sold for $10,000 per ounce. Ginseng is often said to be able to enhance libido and treat sexual dysfunction in men. Despite the fact that many manufacturers market their ginseng supplements with these claims, there is no scientific evidence to support that the plant has any such abilities. Personal care. Ginseng can also be found in various soaps and cosmetic products. Gardening. Some people do grow ginseng plant as an ornamental, particularly because it is relatively low-maintenance and aesthetically pleasing appearance. To this day, ginseng retains its stature as a powerful herbal remedy. Civilization has developed a wide range of ways for people to consume the plant, and use it to treat many different conditions. Continuing scientific studies are likely to reveal further uses for ginseng, and so it is likely to be cultivated and therefore available worldwide, for the foreseeable future.